Basic ingredients: Making the most of Scotland’s superb meat and fish, Nick Nairn and his team of chefs provide a wide range of mainly day courses for all culinary levels. Nairn hosts a number of the Scottish cookery classes himself and there are masterclasses on game and poultry and occasional classes with visiting celebrity chefs such as Atul Kochnar. The “Can you stand the heat?” corporate packages look like they mean business. They say: We are the original and best cookery school since 2000. Come along for chocolate therapy or Nick’s graduated Scottish cookery masterclasses. We say: This is a polished outfit with its own cook shop and a great place to get a feel for contemporary Scottish cuisine. 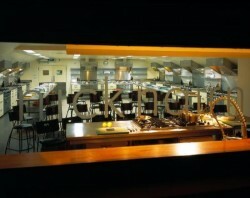 Leave any preconceptions you might have had about Scottish cooking at the cook school entrance.